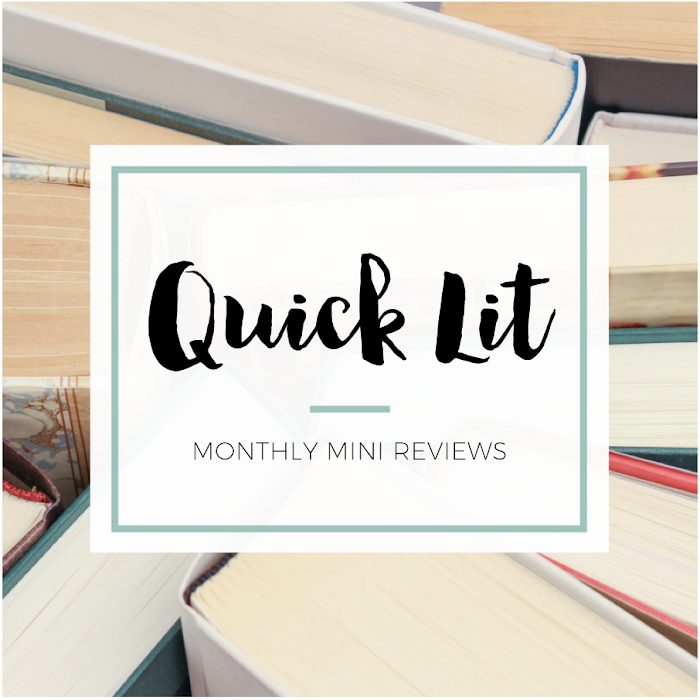 I've shared three posts of favorite baby products in the past year (So Obsessed With: The Baby Edition #1, #2, and #3), but I hadn't talked about books yet. 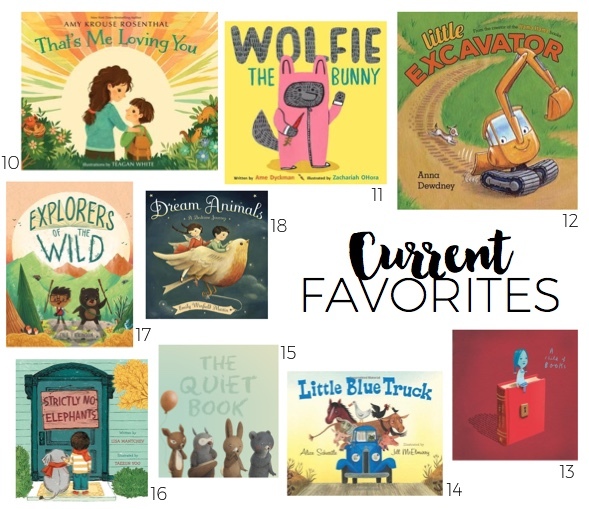 I've had this post on my mind for months, and I finally made the time to sort through our ever-growing library of picture books to pick out our favorites. 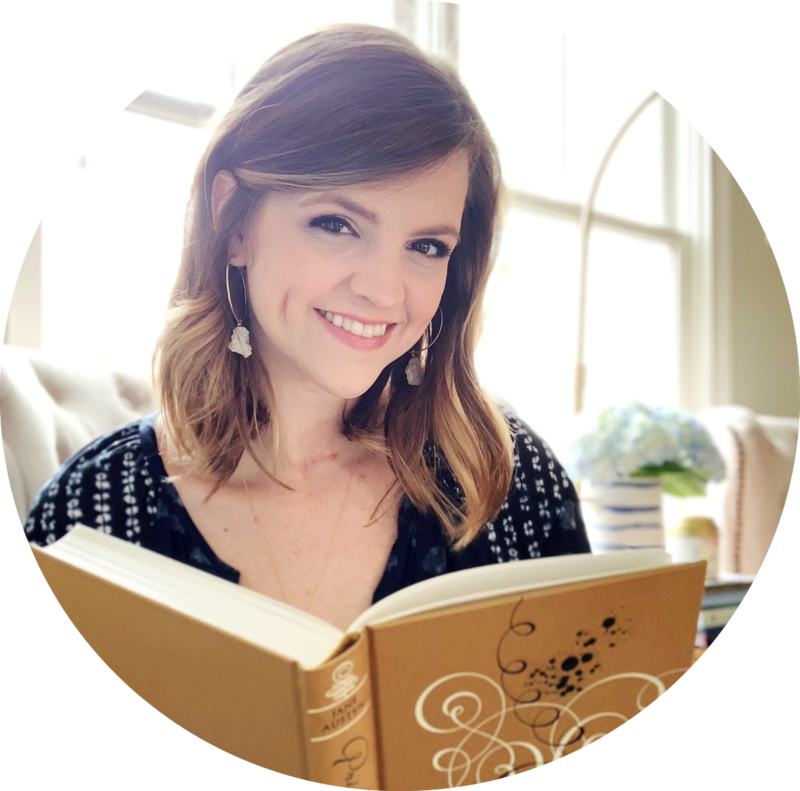 We spend a lot of time reading in our household, and it didn't take me long to identify our most-read books! For a long time, we read the same 1-2 books on repeat. When my son was a newborn, we'd just read one short book before naps and nighttime sleep. It was boring, but it helped us establish a routine. I still read to him before both naps and bedtime, but now it's usually for about 10 minutes before naps and 15-20 minutes before bed (unless we're too tired to read that long). And, of course, we read throughout the day! There's a bookcase in the nursery, and the side table next to the chair has a shelf for current favorites. We've got a basket of books in the living room, too, where we spend a lot of our time. My boy is surrounded by books! I think those two things - making reading part of our daily routine and having books readily available in the areas where we spend our time - have been the biggest ways I've helped my son develop a love of books. He loves having us read to him and flipping through books on his own. He's got very strong opinions on what he does and does not like, so the following list contains only books that have his seal of approval. I don't love all of his favorites, which I'll mention in my comments on each book, but many of the books are winners for both of us. And there are plenty of picture books that I love that he wants nothing to do with... haha! 1. All of Baby Nose to Toes by Victoria Adler - I found this for a few dollars at a used bookstore and couldn't resist it. We love the illustrations, the way it goes through all of the baby's adorable features (eyes, nose, tummy, etc.) and the repetition of the question "Who loves baby's _____?" with "Me! I do." as the answer. 2. Goodnight Gorilla by Peggy Rathmann - For a few weeks, it seemed like this was the only thing my son wanted to read! He loves pointing to all the different animals. There are no words in this book - sometimes it's fun to embellish the story as I go... and sometimes I just wish I could read out loud without having to think. 3. Everywhere Babies by Susan Meyers - I love this book, and so does my son! He can be pretty opinionated on what he does and does not want to read, but this ones always gets a "YES!" It celebrates all the things babies learn to do and way they are cared for "everyday, everywhere." It's wonderful, as are the diverse illustrations. 4. We're Going on a Bear Hunt by Michael Rosen & Helen Oxenbury - This is a book that I want to like more because my son loves it. The repetition gets so old to me when I'm reading it out loud, though I'm sure that's a big part of why he loves it + all the noises are fun to act out. But shhh! - sometimes I skip over parts of it. 5. Alphaprints: ABC (and 123) by Roger Priddy - These are a big hit in our house! I think my son loves all the bright colors, the fun text, the embossed fingerprints that are fun to touch and random objects that are used to illustrate the animals. I have a feeling he'll like these for a long time! And I love that they'll help him learn. 6. Bunny Roo, I Love You by Melissa Marr - This is probably in our top five favorites from this whole list. I adore Teagan White's illustrations (the reason I bought the book in the first place). And I love every single thing about the text inside! This will be a go-to baby shower gift for me, without a doubt, because it's just so sweet. 7. Most of Sandra Boynton (The Going to Bed Book) - Boynton is definitely popular with my son, though we don't own all of her work. I don't particularly like these books, but my son doesn't really care about my opinion. Haha! We read The Going to Bed Book frequently when he was younger because it's short and simple. 8. I Love You Through and Through by Bernadette Rossetti-Shustak - Aww, I will always associate this book with my son as a newborn. For months, we read this book before every single nap + bedtime. It's not that I love it that much - it's just what seemed to work for him. He cried through so many books early on, but not this one. 9. The Lion and the Mouse by Jerry Pinkney - This wordless adaptation of one of Aesop's fables is absolutely gorgeous! I try to avoid "reading" this one when I'm too tired, but my son loves it even when my storytelling is a bit lackluster. He loves roaring for the lion, pointing to the mouse and staring at the detailed illustrations. 10. That's Me Loving You by Amy Krouse Rosenthal - This book was on my radar because I love the work of illustrator Teagan White. Thankfully, the story was just as lovely! The parent is reminding the child wherever they go, the parents love will be there too. It's super sentimental, but I love it all the same. 11. Wolfie the Bunny by Ame Dyckman - My son loves this silly book about a family of bunnies that adopts a wolf. And I think it's such a sweet way to talk about an older sibling coming to love a new addition to the family! It's a fun book to read aloud, and the illustrations are very eye catching. We read this one a lot! 12. Little Excavator by Anna Dewdney - My son usually prefer books about animals or kids, but this is the rare exception. He likes looking at all the different construction vehicles, especially because the text includes lots of noises. The rhyming makes it very sing-songy to read aloud, and the message is a good one. 13. A Child of Books by Oliver Jeffers - I got this book because I loved it, and initially my son wanted nothing to do with it. It didn't surprise me because I think this will be most appreciated by adult book lovers, but recently my son has changed his tune. I'm happy because it's a lovely tribute to imagination and the power of stories. 14. Little Blue Truck (and Little Blue Truck Leads the Way) by Alice Schertle - This is a top five favorite for both of us! It's one of the first "longer" baby books that my son would sit through. We love everything about it: the illustrations, the rhyming text, the message about being friendly, and all the sound effects. 15. The Quiet Book (and The Loud Book) by Deborah Underwood - We love reading The Quiet Book at bedtime - the perfect read aloud to wind down before sleep. I never would have thought of all the "different kinds of quiet," so I'm a fan of the concept of this one. The illustration are soft and muted, which is just right for the story. 16. Strictly No Elephants by Lisa Mantchev - Oh man, I love the message of this story: when a boy and his elephant are banned from a pet club, they create their own where all are welcome. I appreciate the diversity in the illustrations (which are also so lovely) and the themes of inclusiveness. A surprise treasure! 17. Explorers of the Wild by Cale Atkinson - This was a random find at the library, and it's gone on our "to buy" list because my son loves it so much. It's cute to see the little boy and the bear exploring the wild - and then teaming up to have adventures together! The story is simple but sweet, and I'm a fan of the illustrations. 18. Dream Animals (and Day Dreaming) by Emily Winfield Martin - I bought these for my son this past Christmas (mostly because I love the artwork), and they were a little too long for him at the time. Now he really enjoys these books, and I like that they celebrate dreams and imagination. They're lovely books! 19. Llama Llama (gotta start with the original, Llama Llama Red Pajama) by Anna Dewdney - Y'all, we love all the Llama Llama books in our household! The illustrations are cute, the situations are relatable (like llama's first overnight trip in Llama Llama Gram & Grandpa) and the sing-songy text is perfect for reading aloud. 20. Little Critter (I Just Forgot is our favorite!) by Mercer Mayer - My mom wouldn't stop talking about how much she loved the Little Critter books when we were kids and how she regretted getting rid of them. Thankfully, my boy got quite the collection for his birthday and he loves them! These are probably our most-read books. 21. If You Give... (If You Give a Mouse a Cookie is a winner) by Laura Joffe Numeroff - I found a cute little box set of five of these books at Costco earlier this year and gave them to my son for his first birthday. At the time, he didn't really care for them. But lately, he's obsessed! He likes the silly antics of the animals. 22. BabyLit Primers (Pride & Prejudice is my son's favorite, and YES I'M SO HAPPY!) by Jennifer Adams - Years ago, I told my mom I wanted these for my future baby. After I found out I was pregnant, she got my baby's library started. We like some of these primers more than others, but the illustrations are so cute in all of them. 23. Sharing the Bread by Pat Zietlow Miller - I saw Betty talking about this book back when she blogged and bought it based on her rec. I'm so glad I did! We've been reading this one on repeat lately. I love the message, the illustrations and the way each member of the household contributes to the Thanksgiving meal. 24. A Night of Great Joy by Mary Engelbreit - This is one of the few Christmas books I've found that I like too because it explains the Nativity in an engaging way. It isn't too short or simplified, but it isn't super long either. I like that the illustrations depict kids performing the story at a Christmas pageant. It's unexpected and cute! 26. The Story of Easter by Fiona Boon - This was in my son's Easter basket, and he loves it way more than I expected! This book tells the story of Easter with rhyming text and cutesy illustrations. I like that it's simple enough for my son to listen to it, but it still accurately tells the story and presents the Gospel. 27. Bright Baby: Animals by Roger Priddy - This book is basically just a bunch of photos of animals labeled with their names, but my son loves it. He likes to point to the photos, tell me the noise they make (for the ones he knows) and have me say the name. But the "Lift-the-Tab" on the cover made me think it had flaps (it doesn't). 28. Where's Spot? by Eric Hill - This, on the other hand, is a lift-the-flap book and makes a frequent appearance around here. The story is kinda dumb, but the point of this is obviously the hide-and-seek aspect. Boring but a definite favorite for my son and it's cute when he seems surprised to find Spot in the end. 29. Busy Farm by Scholastic - This is a lift-the-flap book that teaches colors, numbers, shapes, animals and animal noises. I'll often bring this one in the car because it entertains my son for a little while. I like the learning element and that it uses real photos rather than illustrations (so it's easier to teach him to identify things). 30. Let's Find Momo by Andrew Knapp - This is definitely my favorite of the four "activity" style books! The left page in each spread has four objects to find (one is always the dog, Momo) and the right page has a photo in a different setting (a bookstore, a carnival, etc.). The dog is adorable, and my son likes finding the objects! What picture books should we read next? The Going To Bed Book was my son's favorite bedtime book for at least a year. I can still recite it by heart! At age two, he would "read" all the lines to me with his little speech impediment, ending with "them [sic] wock, and wock, and wock to sweep." :'D He's 26 now. Thank you, Sandra Boynton. I had to get on my laptop to comment on this one! 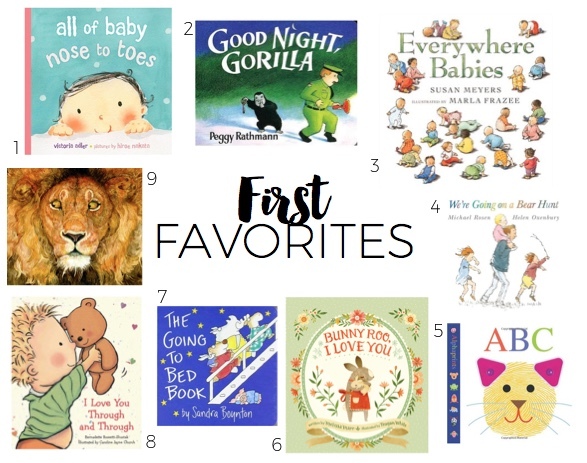 So many wonderful books here Hannah -- now I'm thinking I'm due for a picture book post too :) My son also loves Goodnight Gorilla, I Love You Through and Through (pretty sure this one is how he learned body parts! ), Little Blue Truck, We're Going on a Bear Hunt, If You Give a Mouse a Cookie (though he may like If You Take A Mouse to School even better), Little Excavator, and various Boynton books. Like you there are some we both love and others that one or the other of us loves when the other does not. It's interesting to me to watch his interests evolve. Many books were flops the first time we tried them, but then went on to be favorites. Toddlers sure do like a familiar routine!